There be dragons! While not long ago American female skimo racers were as rare as dragons, history is now changing into the present. And in the very near future, you will be wearing this Ski Trab Dragon Suit and racing up and down mountains like there were a reason. If you find yourself getting oddly serious about this addictive sport, style will surely follow. With skis to match, the Dragon suit will look great on the course. The function goes without saying, as the suit is loaded with six (count ‘em) stomach pockets, boot buckle cutouts, and a ventilated back. No excuses now, in the current present. Stirrups secure the cuffs, which feature holes for boot buckles. Holes cut into the back allow key ventilation under your pack. Stomach pocket with many dividers helps you stay organized. Update 2016/17: The suit is now a 2-piece instead of a 1 piece. 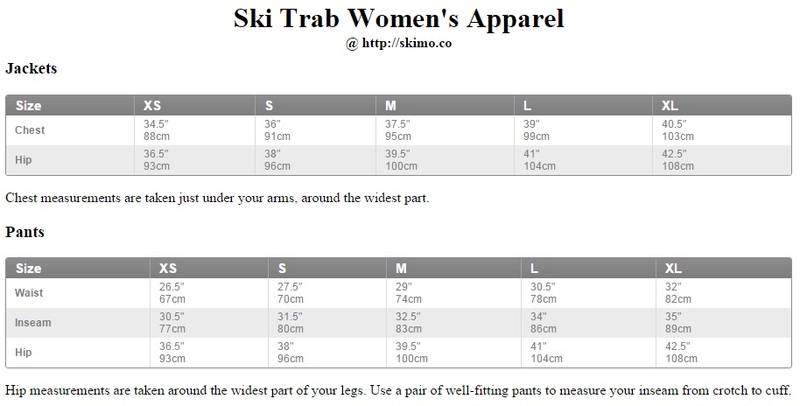 Do you have a size chart for women's ski trab dragon suit? Hi Nancy, I just posted the size chart for you.